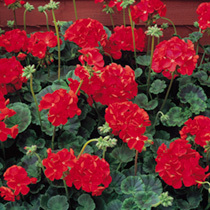 These F2 hybrids give you uniformity, vigour and prolific flowering at an unusually low price! In four colours - take your pick! Height 30-38cm (12-15). HHP - Half hardy perennial. RED - Rich scarlet. Also available: Deep Rose, Salmon & White.